This is a PvP Sharpshooter-based build for the Gunslinger, and by extension, the sniper. Note: This build was created with the Darth Hater Talent Calculator. The link to view this build is here. For the correlated Sniper build, click here. Goal: This build is about doing as much damage as possible while in cover. Burst damage is king in this build, and it is made for getting rid of the annoying player on the other team that needs to die. Steady Shots (2/2) – Increases the damage of Charged Burst, Speed Shot, and Wounding Shot by 6%. You will use these skills a lot, so any straight up damage boost is good. Sharpshooter (3/3) – Increases accuracy by 1% per point put in, which means more DPS. The defense penetration that comes from Accuracy is very handy in this build, since the damage type for most of your attacks is energy, which means that it can be mitigated by shield and dodge easily. Percussive Shot (1/1) – A must have, this skill adds knockback to Aimed Shot (big sniper-shot) when used within 10m, the approximate distance of “Oh crap, that Sith Marauder is RIGHT on top of me.” This skill puts them back at range, a very good thing for you. Ballistic Dampers (2/2) – This grants 3 charges of a damage-reducing shield upon entering Cover, which means that you will take less damage, 30% when fully spent. Good thing in PvP. I have developed a PvP strategy called the Dampers Defense (which works well in solo PvE situations as well) that uses this ability extensively. Sharp Aim (2/2) – Aimed Shot ignores 20% of your enemies’ armor, which means your hard hits hit harder. Trip Shot (0/2)– Reduces cooldown of Trip Shot, which is a root. However, this skill is at that weird cooldown length that it might be useful twice an encounter anyway, but reducing its cooldown a tiny bit might not give you more availability in that same encounter. Points better used elsewhere in my current opinion. Snap Shot (2/2) – Entering cover has a chance to make Charged Burst able to be activated instantly, which means Cover = instant damage to your enemy. At 2 points, it always activates (100% chance). Diversion (1/1) – Reduces accuracy of the target by 45% and pops them out of Cover. This is great against Imperial Snipers, and they will probably use it on you too. The best thing is it reduces accuracy, so 1v1s will be helped greatly with this, and it can be used on most classes for the accuracy debuff. Quick Aim (2/2) – On crits, Charged Burst and Speed Shot reduce your next Aimed Shot’s activation time. This means faster deliverance of death. The activation time is reduced to 1.5 seconds, the length of the global cooldown, so as fast as Charged Burst. Slick Shooter (2/2) – Increases critical hit chance of Charged Burst, Speed Shot, and Trickshot by 4%. Helps to trigger Quick Aim (above). Spacer (1/1) – Increases knockback distance of Pulse Detonator, which is good, but it also reduces activation time of XS Freighter Flyby by 1 second, which is great in PvP, because you often don’t have a lot of time to get that off. Rapid Fire (3/3) – This frequently re-designed talent currently gives 3 seconds off of the cooldown on Aimed Shot and Speed Shot, 1 second per point. Foxhole (1/1) – Increases energy regeneration by 1 per second while in Cover. In high-demand situations, this is nice to have. Recoil Control (2/2) – Reduces energy consumption and cooldown of Trickshot, a key skill. With 2 points spent, this ability makes Trickshot almost as cheap as Flurry of Bolts! It certainly packs a punch for such a cheap skill. 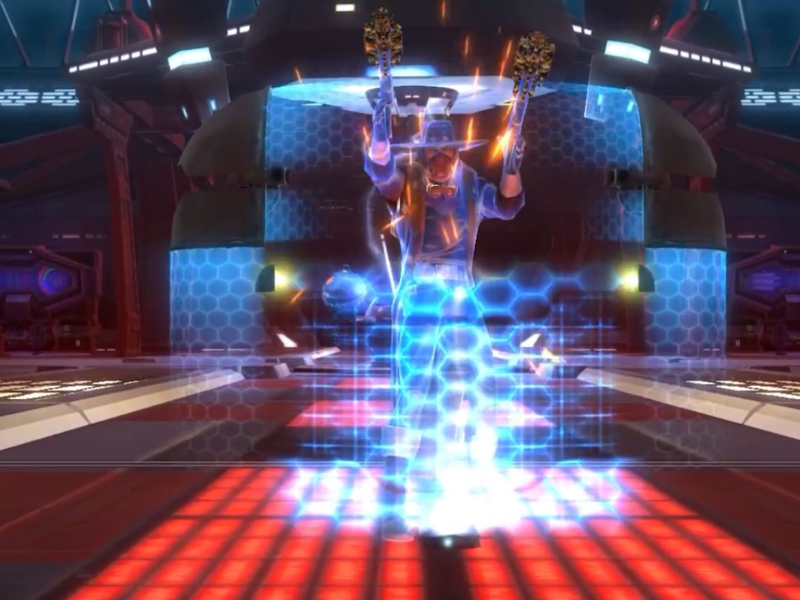 Trickshot (1/1) – Gives a high-DPS skill that is only usable within 4.5 seconds of Charged Burst or Aimed Shot. I love this skill, as it is low cost, high critical payout, and generally easy to use since it is instant. Lay Low (2/2) – Reduces cooldown of Hunker Down and XS Freighter Flyby. I love Hunker Down now, and the more often it is available, the more I am happy. Deadeye (3/3) – Increases critical damage from Speed Shot, Quickdraw, and Trickshot by 30% when fully spent. That extra crit damage is very much worth it, especially with a high crit chance. Burst Volley (1/1) – Grants a skill that immediately ends the cooldown on Speed Shot, and grants 50% extra energy regeneration as well as 10% bonus Alacrity. On a 45-second cooldown, this is a great skill for use in high-demand scenarios, especially when paired with Illegal Mods. No Holds Barred (3/3) – Regardless of your build, this is a great ability, as it increases crit chance. This is especially good for us since we have a few abilities in the Sharpshooter tree that require crits to proc. Saboteur’s Utility Belt (2/2) – Reduces cooldown of Flash Grenade and Thermal Grenade. Normally I wouldn’t suggest lowering cooldowns on AoE skills in PvP, but having Flash Grenade available more often means that you have a great instant CC ability to help you escape when someone tracks you down in Cover. Streetwise (3/3) – Gives 9% Cunning. When you are well geared, that is a lot extra of your primary stat. Independent Anarchy (2/3) – This is to buff Sabotage Charge and other AoE effects by 10% in damage. Considering that XS Freighter Flyby is a great skill on a lower cooldown and activation time with this build, this isn’t a bad skill to have. Also, Sabotage Charge should always be on cooldown, as it is a great bit of burst in the beginning of a rotation. Be sure to check out the Gunslinger/Sniper Advanced Class Guide. Cybertech, Scavenging, and Underworld Trading. I am attempting to cover all the bases though. Cybertech has the most ubiquitous uses, since Armoring slots are on all Custom armor, and Mod slots are on every Custom item period. would you recon leaving out saboteur’s utility band (saboteur) and flash powder(dirty fighting) for foxhole(sharpshooter) and streetwise(saboteur) to be a good idea? For a PvE build, definitely. For PvP, it is more or less personal taste. Foxhole is only useful in Cover. If you are trying to stay in Cover only in PvP, you are going to sacrifice your mobility. It depends on if the extra energy regeneration is worth staying still most of the time. Streetwise would definitely be useful in PvP for the extra damage, but I sacrifice that in this build for the lowering of the other team’s damage through Flash Powder. With Flash Grenade’s cooldown at 1 min now, you can be consistently hindering their damage, especially with Saboteur’s Utility Belt, since the cooldown will then be a mere 45 seconds. In summary, it depends on your playstyle, but I sacrifice the small amount of regen which I would get ONLY in cover and the not-insubstantial stat boost for more flexibility and mobility, two things that PvP needs generally. It is definitely situational. I personally don’t see it as a must-have any more, but it is rather effective in keeping the high ground when you need to. Resolve is a tricky mechanic, but as long as you keep interspersing your CC (instead of using it all at once), you can usually keep them from white-barring. Looks like you do that, so that is good. Also, and this is often unknown to people, roots don’t respect or build Resolve. While less effective on ranged players, this is crippling to a Marauder or Juggernaut. 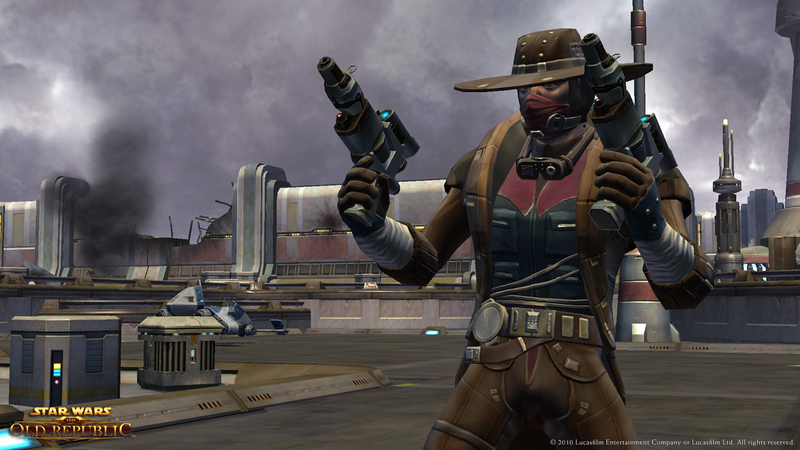 Smuggler Weekly: ‘Cause Every Girl’s Crazy ‘Bout A Sharpshootin’ Man | TORWars – SWTOR News, Opinion & Podcast! Is Legion a classy broad or broadly classy? How long have I been playing MMO’s again? Death to the leveling game! All about my new project!